Reprint. Originally published: New York: Farrar, Straus and Giroux, 2016. `Brilliant' Guardian Waterstones Non-Fiction Book of the Month (March) SHORTLISTED FOR THE 2017 ROYAL SOCIETY SCIENCE BOOK PRIZE What if intelligent life on Earth evolved not once, but twice? The octopus is the closest we will come to meeting an intelligent alien. What can we learn from the encounter? In Other Minds, Peter Godfrey-Smith, a distinguished philosopher of science and a skilled scuba diver, tells a bold new story of how nature became aware of itself - a story that largely occurs in the ocean, where animals first appeared. Tracking the mind's fitful development from unruly clumps of seaborne cells to the first evolved nervous systems in ancient relatives of jellyfish, he explores the incredible evolutionary journey of the cephalopods, which began as inconspicuous molluscs who would later abandon their shells to rise above the ocean floor, searching for prey and acquiring the greater intelligence needed to do so - a journey completely independent from the route that mammals and birds would later take. But what kind of intelligence do cephalopods possess? What is it like to have eight tentacles that are so packed with neurons that they virtually `think for themselves'? 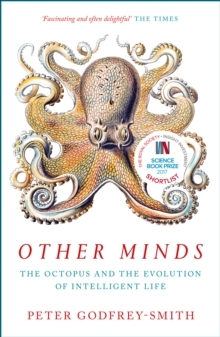 By tracing the question of inner life back to its roots and comparing human beings with our most remarkable animal relatives, Godfrey-Smith casts crucial new light on the octopus mind - and on our own.